After another delicious breakfast, our group gathered on our coach for our first adventure. As in the past, when we had taken a tour, we were given little receivers and earplugs. They call them " whispers". In most cities, a regular a city guide has to give the tour, so this very nice lady gave us many hours, on and off the bus, of interesting Polish history, especially about Warsaw. Our first stop was a very large park, Royal LaZienk Park, which is the park in Warsaw, occupying 76 acres of the city center. Originally designed in the 17th century as a baths park. In the 18th century ŁaZienki was transformed by Poland’s King Stanislaw August into a setting for palaces, villas, and monument. In 1918, it was officially designated a public park. While the Germans ruled the area of Poland only Germans were allowed in the pool in the park. The park contained a huge statue of Chopin and several large royal palaces. The Chopin Statue is a large bronze statue of Frederick Chopin that now stands in the upper part of the park. It was designed in 1907 to be erected on the hundredth anniversary of Chopin's birth outside of Warsaw in 1810, but its execution was delayed by controversy about the design, then by the outbreak of World War I. The statue was finally cast and erected in 1926. During World War II, the statue was blown up on May 31, 1940. It was the first monument that was destroyed by the occupying Germans in Warsaw. The original mold for the statue, which had survived the war, made it possible to cast a replica, which was placed at the original site in 1958. Since 1959, on summer Sunday afternoo ns free piano recitals of Chopin's compositions are performed on a stage at the base of the statue. The stylized Willow tree over Chopin's seated figure resembles a pianist's hand and fingers. We walked through the park, which contain several beautiful palaces. The bus was waiting for us on the other side. From the park, we went to the Polin Museum where we went yesterday; however, today we didn't go inside. The city guide told us all about the Jewish ghetto and much of the history that we saw illustrated so well in the museum. Next, we made a brief stop at the Warsaw Uprising monument. There was no place for the bus to park so we had view it from inside the bus. The monument is located on the southern side of Krasinski Square. In 1999 the building of the Supreme Court of Poland was constructed in the area directly behind it. 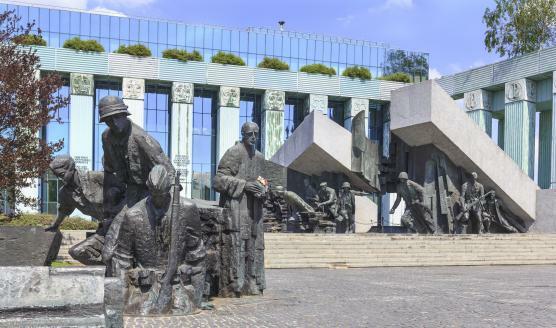 The Warsaw Uprising Monument is made from bronze and is about 33 ft. tall. It is composed of two parts, located within a short distance of each other. The larger, elevated element shows a group of insurgents actively engaged in combat, running from a collapsing building. The smaller element shows insurgents descending into a manhole – a reference to the use of Warsaw's sewer system by the insurgents to move across German-held territory during the uprising. Over 5300 resistance fighters escaped from Warsaw's Old Town to the city center at the beginning of September 1944. It was a five-hour journey which started from Krasiński Square. There is a small plaque across the road from the monument at the intersection of Długa and Miodowa streets above the two manholes that were actually used. Then the bus took us to Old Town Warsaw which had been completely destroyed during World War II. It has been restored and is a wonderful area with a lot to see. Again our guide walked us through the area with a lot interesting details . Then we had a lunch break and everyone was on their own. Most people ate at the same sidewalk café . I had a wonderful salad of fried shrimp, lettuce, small tomatoes, Parmesan cheese and capers. Kathleen had salmon wrapped in bacon plus other interesting vegetables. We were on our own for two hours so we explored several places of interest to us that were not on the tour, namely several churches. The café where we had lunch was close to the City Wall and The Barbican. In fact, we had to walk through the Barbican that divided the Old Town from the New Town. 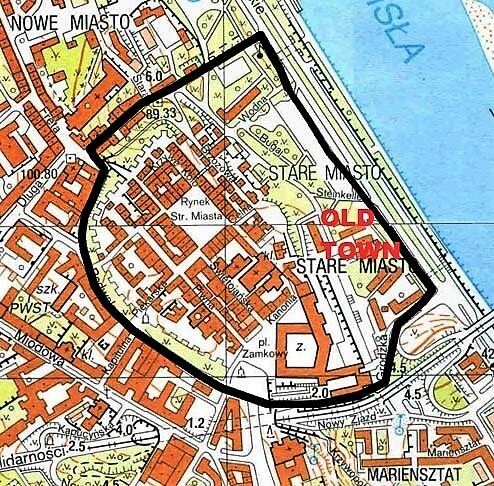 The Old Town of Warsaw is ringed by sections of the old defensive city walls. Construction of the walls began in the first half of the 14th century and continued until the mid-16th century. It is possible to walk along the walls through a special trail running between the inner and outer walls which at one time served as a moat. The Barbican is the oldest part of the fortifications. It was built in 1549 on the site of an earlier gate, probably in response to the increased threat of invasion. It was to be an important element of defensive city walls. But its useful life was rather short. Not long after it had been built, advances in artillery made the Barbican obsolete, and it was used in actual defense of the city only once- when the Swedes invaded Warsaw. It was destroyed during World War II. Its present form is a result of restoration works finished in 1954. In the New Town, we visited two churches. The first was the Church of the Holy Spirit located on the left side of the street shortly after passing through the Barbican Gate. The church was originally built in the Gothic style alongside a hospital in the 14th century. It was probably the first hospital of this type in the region. From 1425 it was a hostel for the poor and in 1473 a chapel, temporary accommodation for guests or pilgrims, and a monastery were added. The parish priest was also the manager of the hospital at that time. During the Swedish invasion (commonly referred to as The Deluge) the church fell into ruin and subsequently burnt down, but the magistrate's resolution from 1664 ensured that the hospital had an income. In 1699 the foundation stone was laid for the new church, which was built from 1707 to 1717 in Baroque style. The construction of the church continued until 1746, when the chapel, dedicated to Our Lady of Czestochowa, was finally completed. By 1800 there were nine priests as well as two German professors and four students studying theology in the monastery. In January 1807, the army of Napole on Bonaparte used the monastery as army barracks. After the war, the monastery buildings were briefly regained as a monastery . In 1825 the monastery opened the main seminary as a theological faculty and later was transferred to the Franciscan order. The remaining part of the monastery was rented as apartments. In 1944, during the Warsaw uprising, the church was almost completely destroyed by the German army; the interior of the church and vaulting burnt down with only the main altar surviving. The church was rebuilt in 1956 in the same form as it was before World War II. St. Hyacinth's Church was founded by the the Dominican Order and adjoins Warsaw's largest monastery. The church is a mixture of Renaissance and early Baroque styles. Its construction began in 1603 and it was completed in 1639. During the construction and shortly afterwards the church was encompassed with ornate chapels. When Warsaw was captured by Swedish forces in 1655, the church shared the same fate as other buildings in the city, it was ransacked and burned. After the war, it was rebuilt and consecrated in 1661. The 18th century was the age of the church's greatest prosperity. St Hyacinth's monastery's library possessed the richest collection of volumes in Poland. The library was later destroyed. During World War II, the church and monastery served the Polish forces in the Warsaw Uprising as a field hospital This fact turned these buildings into targets of frequent bombings by the Germans. During the bombardments over a thousand civilians and insurgents were killed. The façade of the church is baroque, although the interior is completely modern, because very few of the original furnishings of the church were preserved. Among them, the most interesting are the tomb monuments. The photo shows the tomb of Anna Tarnowska, carved from brown Checiny marble in about 1616, which depicts Anna in the typical Polish sepulchral art sleeping pose. I have been unable to identify Anna; however, the are several present days ladies with that name. We walk back though the Barbican, which had a number of artist displaying their art work, into the Old Town. The Cathedral was our next stop. The Cathedral, which wasn't too large, and was wedged in between two other buildings. The street in front was narrow. It was difficult to get a full photo of the façade. St. John's Archcathedral is one of three cathedrals in Warsaw, but the only one which is also an archcathedral. It is the mother church of the archdiocese of Warsaw. Originally constructed in the 14th century, the cathedral was the site of royal coronations and burials for many centuries. During the Warsaw Uprising, (August–October 1944) the cathedral became a battleground and was blown apart by the Germans. The Germans managed to drive a tank loaded with explosives into the Cathedral, and a huge explosion destroyed large part of the building. After the collapse of the Uprising, German Destruction Detachment drilled holes into the walls for explosives and blew up the Cathedral destroying 90% of its walls. As with many Warsaw landmarks, the cathedral was rebuilt several times throughout its history. After the war, it was reconstructed based on its earlier Gothic style rather the Baroque-style structure that had existed before the war. Despite the damage inflicted on the building during World War II, some valuable cathedral artif acts have survived, including a 16th-century wooden crucifix. Inside, the interior features dark wood and white plaster. The stained-glass windows, represent important events in Polish history. St. John’s is not only a place of worship for Warsaw Catholics, but has also become an important place for sacred music. Organ recitals are often held here and the church also hosts an annual organ music festival every summer. We walked back to Royal Castle where we were to meet Marta in another hour. I have a model kit of the Castle that I have not made yet. The Royal Castle in Warsaw is a Castle residency that served throughout the centuries as the official residence of the Polish monarchs. It is located in the Castle Square, at the entrance to the Warsaw Old Town . The personal offices of the king and the administrative offices of the Royal Court of Poland were located there from the sixteenth century. In its long history the Royal Castle was repeatedly plundered and devastated by the invading Swedish, Brandenburgian, Prussian and Tsarist armies. In the 19th century, after the collapse of the No vember Uprising, it was used as an administrative center by the Tsar and was re-designed for the needs of the Imperial Russian administration. During the course of World War I, it was the residence of the German Governor-General. In 1920-1922 the Royal Castle was the seat of the Polish Head of State and between 1926 and World War II the building was the residence of the Polish president, Ignacy Moscicki. Burned and looted by the Nazi Germans, following the Invasion of Poland in 1939 and almost completely destroyed in 1944 after the failed Warsaw Uprising, the Castle was completely rebuilt and reconstructed. Reconstruction of the castle done in 1971-1984 was led by the Civic Committee, responsible for the reconstruction of Warsaw. In 1980, the Royal Castle, together with the Old Town was registered as a protected UNESCO World Heritage Site. We only visited the Royal Castle courtyard. We did not have time to take a tour on the inside. Near the Castle was St. Anne's church which was very baroque on the inside. St. Anne's was reconstructed several times in 1603, 1634, 1636 and in 1667 (it was heavily damaged during the siege of Warsaw and plundered by Swedish and German troops in the 1650s). Between 1740 and 1760 the façade was reconstructed in rococo style according to Jakub Fontana’s design and decorated with two filigree belfries. The walls and semicircular vault ceilings of the church, divided into bays, were decorated at that time with paintings depicting scenes in the life of St. Anne. The church was reconstructed for the last time between 1786 and 1788 in a Neoclassical style. The church was slightly damaged in a German air raid on Warsaw 1939 (the roof and turrets were destroyed by fire and reconstructed). When we visited, there was a wedding going on and people standing around the back so we did too. We watched the rest of the wedding then took photos of the very Baroque interior. Near the castle and St. Anne’s church is the famous statue of Sigismund III. Erected in 1644 to commemorate King Sigismund III Vasa, this impressive structure honors the ruler, who on the turn of 16th and 17th cent. moved from Kracow to Warsaw. Leveled to the ground during the Warsaw Uprising (Sep. 2, 1944) and rebuilt after the war (pieces of the original column, destroyed during WWII, are also on display here). The statue of the king is original – it fell down however it was not destroyed. It is one of War saw’s most famous landmarks and one of the oldest secular monuments in northern Europe. On the Corinthian column - 28 feet high, a sculpture of the King - 9 feet high, in archaistic armor stands. Sigismund’s Column now stands 72 feet high and is adorned by four eagles. The king is dressed in armor and carries a cross in one hand and wields a sword in the other. After our wonderful visit to Old Town, our guide took is back to the hotel in the coach. It was after 4:00 when we got back to the hotel. Of course, Kathleen took a nap and I closed my eyes several times. We are quite tired but are now getting ready to go out by ourselves to eat at a restaurant Kathleen reserved weeks ago. We had to take a taxi, to a restaurant, Rozanna, It was in a beautiful building with a lovely courtyard. We decided to eat inside as it was getting a little cool. Kathleen had a cold beet soup, then catfish with spinach, black lentils and onion sauce. I had veal with gnocchi and carrots. They had an unbelievable dessert cart. It was a hard decision. Kathleen had real Polish cheese cake and I had a cheese cake with fruit. It was a wonderful meal. Small world note: we were having lunch with friends when we got home. When we were describing this restaurant the lady said,” did they have dessert cart surrounded by flowers?” Said that she had been there, who could forget the dessert cart and the wonderful dinner? We got a taxi back home. We needed to finish packing as our bags have to be outside of our door at 6:45 and we have to be on the bus at 7:45. We had a very wonderful time in Warsaw, saw a lot, learned a lot of history, and WALKED A LOT!